Barcelona, 24th August – Port cities like Miami or Barcelona are global benchmarks for cruise ship traffic. Their infrastructures must ensure efficient, incident-free travel for passengers and, of course, impeccable safety standards and quality of service. This year, ADELTE will install tailor-made seaport passenger boarding bridges, the most innovative bridges in the transport sector. Each port has unique needs. Every architect aims for something new. Each company is distinguished by certain qualities. But everyone agrees that boarding bridges should deliver comfort and safety for passengers. 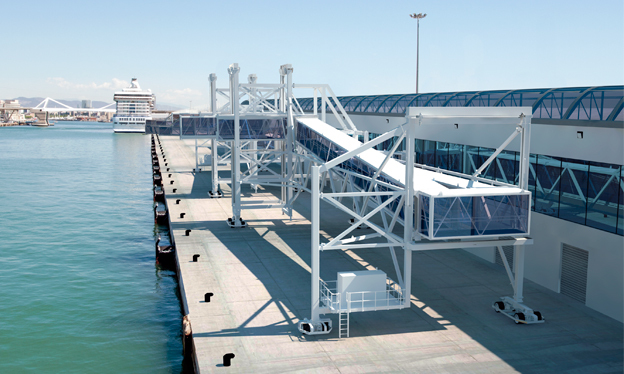 ADELTE consistently designs boarding bridges that not only meet the maritime transport needs of today but are already responding to the challenges of the future, creating innovative solutions adapted to each unique cruise and ferry terminal. Port Miami (USA) is the cruise capitol of the world. In 2016, 5 million cruise passengers passed through its facilities; that’s almost half a million people a month. In 2017, the cruise ship MSC Seaside will be based in Port Miami and ADELTE will design and build two custom seaport passenger boarding bridges (SPBBs) for its mooring at Terminal F. Since the deck of the ship stands 2.8 meters high, a new type of telescopic four-section unit has been developed. Both SPBBs will be shipped fully assembled from Barcelona to Miami to speed up the installation time at their destination. In another US port, Seattle, Norwegian Cruise Line has also opted for ADELTE technology. In this case, a KRONUS model mobile telescopic boarding bridge and an enclosed elevated walkway to connect with the terminal building. This state-of-the-art system is specifically designed to serve the Norwegian Bliss (and other NCL ships) when the Bliss starts voyages from the Bell Street Cruise Terminal in 2018. Meanwhile in the port of Barcelona, where ADELTE already has extensive experience in delivering 15 boarding bridges, a new project will add 2 more units to the total. Carnival Corporation is currently building one of the largest cruise terminals in the world at the “Adossat” Pier. This new Terminal E, designed by architects Batlle i Roig, will incorporate two HYDRA model bridges, exclusively designed and manufactured for Carnival due to the record distance of 9m between the edge of the quay and the structure of the boarding bridge, anticipating the future evolution of mega-cruise ships. In France, Cherbourg’s “Gare Maritime Transatlantique” is a protected architectural passenger terminal, meaning that any modifications must comply with the requirements of the architect of Monuments of France s. ADELTE will install a specially designed boarding bridge, perfectly integrated with the architecture of the terminal building. This new bridge will replace its predecessor which has been classified as a “historical monument”. In Asia and Africa, the ports of Turkmenbashi in Turkmenistan and Béjaïa in Algeria have relied on ADELTE to modernize their facilities with boarding bridges for their regular ferries. In the case of Béjaïa, the busiest ferries are those going to France and Spain, and Turkmenbashi is a “gateway” linking various cities on the Caspian Sea. Both ports are in the process of creating modern infrastructures with faster embarking and disembarking, designed to manage passenger traffic in the most efficient and safe way. Also in Asia, the port of Keelung in Taiwan will soon benefit from a second ADELTE boarding bridge, based on the SEDNA model, incorporating an additional docking cabin positioned on the other side of the bridge. This innovation will improve operability, flexibility, and guarantee that all cruise vessels will benefit from the best facilities. “Each port has particular characteristics depending on their traffic, architecture and infrastructure. Our design innovations mean our bridges are highly versatile and can be adapted to different types of docks, ships and facilities, making for faster project delivery” says Jordi Floreta, Vice President and Commercial Director of ADELTE.